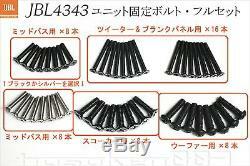 Unit fixing bolt set for JBL4343 from JAPAN F/S. It is a brand new full set (pair) of speaker unit fixing bolts for JBL 4343. It is a steel bolt similar to JBL genuine · black plating finish. According to the old and new years of 4343, specification color of bolt for mid bus. There are two kinds, black or silver. Please let me know which one you would like. In addition, it is not a full set, there are also 8 packs of each type. The reason why your existing speakers look older. It is largely due to the rusting and decaying of the bolt which is a metal part. It seems to be fine, but just replacing the bolt with a new one will revive the speaker. After all it is important to listen to the sound pleasantly. Set content · Tweeter & blank panel x 16 · For squawker × 8 · For mid-bus × 8 (either black or silver) · For woofer × 8. Please let me know if you have any questions. Also, please tell me if you have what you're looking for in Japan items. International Buyers - Please Note. These charges are the buyers responsibility. The item "Unit fixing bolt set for JBL4343 from JAPAN F/S" is in sale since Wednesday, August 16, 2017. This item is in the category "Musical Instruments & Gear\Pro Audio Equipment\Other Pro Audio Equipment". The seller is "japanderful" and is located in Tokyo. This item can be shipped worldwide.